In celebrating Valentine’s Day, I never thought beyond cards, candy, and perhaps some extra hugs for and from my loved ones. It wasn’t until my sweet mother-in-law gave Daughter a children’s book about St. Valentine that I connected the holiday to an actual person. Valentine’s Day, just like Saint Patrick’s Day, is the feast day of Saint Valentine, as designated by the church. 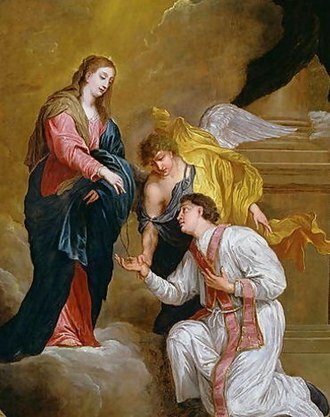 Valentinus was ultimately executed in Rome and buried on the Flaminian way in 269. Since he is the Patron Saint of love, lovers, engaged couples, and happy marriages young people (also bee keepers, travelers, epilepsy, fainting, greetings, plague and travelers!) it makes sense that we celebrate love on his feast day. But Valentine’s Day as we know it seemed to pop up around 1375, after English poet Geoffrey Chaucer wrote “Parliament of Foules”. In this poem, Chaucer writes of February 14 as the day when birds come together to find a mate. From this point on, Valentine’s Day became associated with romantic love. Whether we have Valentinus or Chaucer to credit, all these years later we are still preparing to celebrate Valentine’s Day, often exchanging chocolates (and kisses!) with our sweethearts. Which is why the following excerpt from Think Italian about the delicious Italian candy, Baci, caught my attention. Just for fun (and completely unsponsored), I offer a little dual language Valentine’s Day gift to you. Translation by me, corrections welcomed! Perugina is the name of a very famous confection company in Umbria, which produces chocolates and other sweets. Founded in 1907 and acquired by Nestle’ in 1988, it is known for it’s very good, unequalled Baci Perugina. (Kisses, pronounced bah-chee). The Baci in Italy are a symbol connected to love and to Valentine’s Day because the company has always used an aggressive marketing campaign: in every little chocolate you find a romantic phrase written in various languages. Do you have a fun fact to offer about St. Valentine or Valentine’s Day traditions in Italy or around the globe? Please share with us in the comments! Tags: Baci chocolates, St. Valentine, Valentine's Day. Bookmark the permalink. Very interesting – will appreciate holiday more!!!! A very enjoyable read! I wonder if the Baci were named before or after Nestle’s acquisition? Did they exist before or after Hershey’s kisses? Well, in any case, I am definitely craving chocolate now! Maybe the more important question is are they sold in the US? Seattle? My neighborhood? I love that the Baci have the romantic phrases wrapped in them. Grazie tante, e adesso dov’e il mio cioccolato? Thank you Anna! Glad you enjoyed the post! I believe the candies started with the name Baci. You can get them in the US. Search Baci Perugina online for their US website. Enjoy!